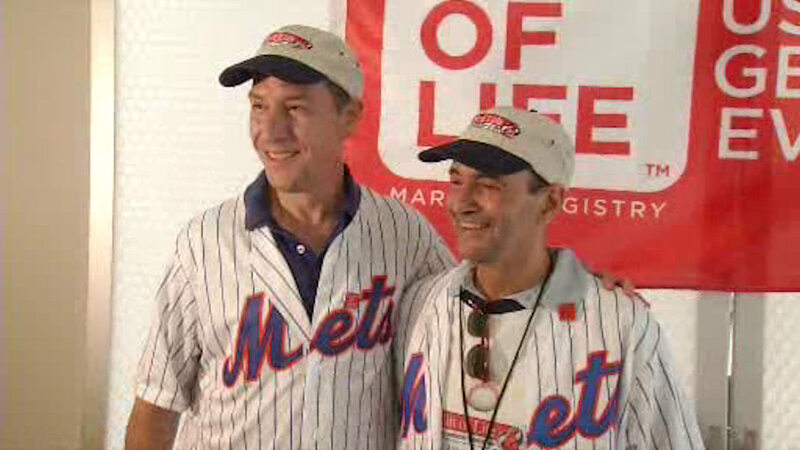 NEW YORK (WABC) -- Before the New York Mets took on the Chicago White Sox on Tuesday night, Citi Field hosted a special first time meeting set up by the Gift of Life Marrow Registry. Richard, who was diagnosed with multiple myeloma back in 2012, was a special guest of the Mets as he was introduced to David, the man who provided the blood stem cell donation that saved his life. After a transplant with cells collected from his own blood didn't work and a bout with pneumonia, doctors recommended a transplant of stem cells from a donor, which is when the Gift of Life Marrow Registry became involved. Richard was training for a half-marathon with his daughter Sarah when he was shockingly and unexpectedly diagnosed with the plasma cell disorder. Since the transplant, Richard has been healthy and is in the process of planning a hiking trip in the Adirondacks. The Gift of Life Bone Marrow Registry is a non-profit organization that helps children and adults find donors for bone marrow transplants whenever they may need one.